On Tuesday, June 9, the Muzej za umjetnost i obrt/ Museum of Arts and Crafts Croatia organized an event that celebrated the results and outcomes of the AthenaPlus project such as the open-source creative tools (MOVIO, City Quest, Plan your own Schooltrip, eCultureMaps – access to the tools is provided HERE). The event was featured on local television (HTV1), in a newspaper article (Novi list), and on 4 radio segments (HR) in the following days. Moreover, the Museum of Arts and Crafts also produced a beautiful AthenaPlus leaflet (in Croatian language) that summarizes the project’s objectives and promotes the services and free-open tools. In early July the AthenaPlus consortium gathered in Barcelona to report about the achievements and results that have been produced in the final phase of the project. AthenaPlus is a best-practice network that aims at experimenting with enriched metadata in order to make digital cultural content reusable. In the frame of the AthenaPlus project tools and services adapted to the needs of different user groups are being developed. These to0ls support the development of digital exhibitions >MOVIO as well as tourist >City Quest and didactic >School Trip applications. 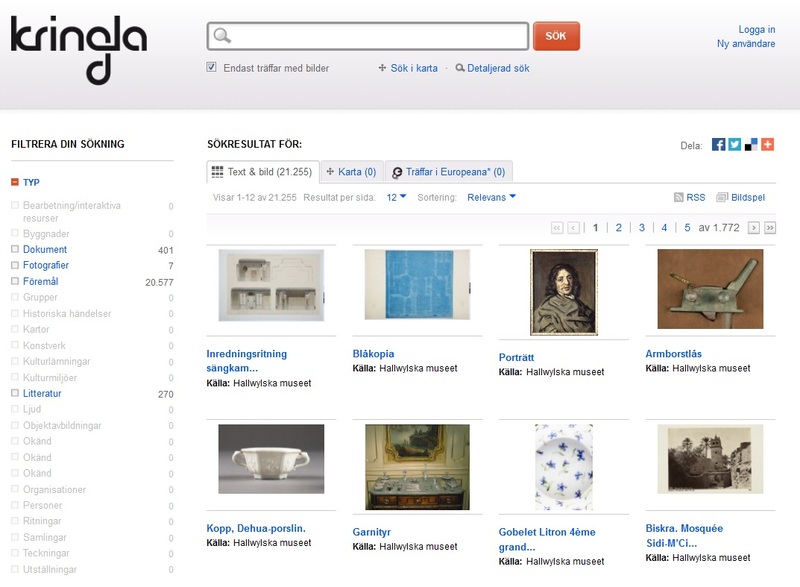 All the open-source tools will be integrated into Europeana repositories and the repositories of national aggregators and individual Content Providers. The 6th AthenaPlus plenary meeting was organized by our Spanish project partners and took place in the beautiful Palau Moja building situated in the pedestrian-mall La Rambla, Barcelona. The first day of our plenary meeting was dedicated to presenting the AthenaPlus tools and services as well as some outstanding examples of digital exhibitions realized with MOVIO to the consortium. Training sessions were offered in order to instruct project partners in how to use and disseminate the project’s services. of exhibitions in the original language and in the English language when a translation is available. The eCultureMap has been developed to demonstrate the use and re-use of Europeana, AthenaPlus and other digital cultural heritage content, when browsing the content geographically. 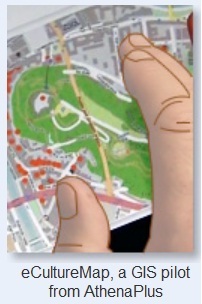 Currently the map has three main uses: a user may find out what cultural content is present on a certain location, plan a cultural route or upload own content. A GIS Pilot action resulting in use cases and an application has also been realised. The 2nd version of the Thesaurus Management Platform (TMP) developed in the AthenaPlus project offers to users a wide range of different functionalists, such as creation and editing of thesauri, management of multilingualism, integration of ISO standards 25964-1 and ISO 25964-2 on Thesauri, import and export in SKOS, JSON and RDF, thesaurus mapping, etc. Click here to download the new AthenaPlus TMP newsletter. (English). On the second day in Barcelona requirements for the visualization and indexing of museum content were discussed by the consortium members. Afterwards the international Digital Exhibitions Working Group presented its outputs and achievements that were produced during the lifetime of the project to the entire group. The afternoon of day 2 was reserved to discussing and planning the final phase of the AthenaPlus project. The Digital Exhibitions Working Group that was established in 2011 by academics from Greece, Hungary, Israel, Italy, Poland, Romania, Belgium, Sweden and Germany presented to the AthenaPlus project members its most recent publications and outputs, such as a checklist with points to consider when creating a digital exhibition and a best-practice booklet on metadata for the description of digital exhibitions. Moreover, also the working group’s databases on tools, literature and digital exhibitions were introduced to the attendees. The final day of the AthenaPlus plenary meeting was dedicated to a workshop on digital storytelling and cultural heritage for education and tourism. The MICHAEL CULTURE workshop was open to the public and offered the opportunity to learn how to make digital content more attractive to the public, providing new experiences and ways for engaging with potential target audiences. The session was topped by a debate on perspectives of digital cultural heritage in cultural mediation, education and tourism. 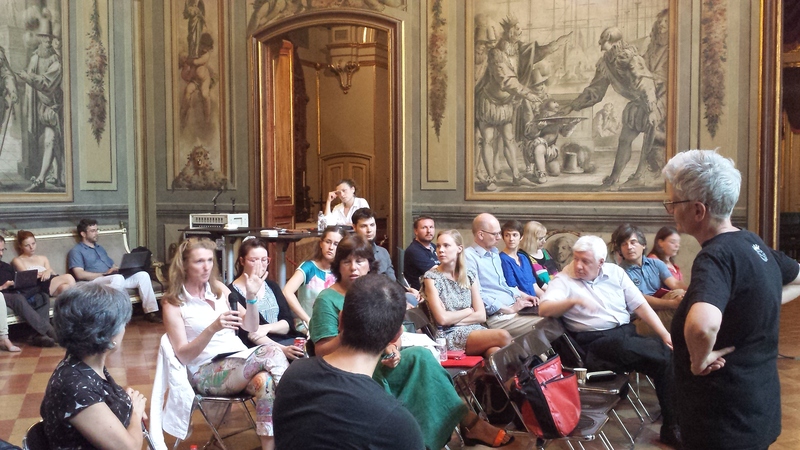 On May 7 2015, PACKED vzw, Openbaar Kunstbezit Vlaanderen, the Royal Museums of Art and History and the Royal Institute for Cultural Heritage organised a conference on the deployment of cultural heritage in an ever increasing digital environment. The conference was supported by the Department of Culture, Youth, Sport and Media of the Flemish Government. These Belgian partners in the European project AthenaPlus joined forces to offer a varied programme in which the concept of ‘digital’ was the central focus point. Does it give rise to opportunities? Or is it actually a necessity that can’t be ignored? Before noon two keynote speakers presented a reflective story, in which they stressed both strategy as well as daily museum operations. Dr. Mirjam Wenzel described the different steps that lead to the development of a digital strategy for the Jewish Museum in Berlin. A SWOT-analysis, personas, networks, an analysis of the technical and human capabilities within the museum, an online strategy for the web platform and its implementation are thereby the building blocks. Karin Nilsson presented the case of the Open Image Archive with which the Swedish Royal Armoury, Skokloster Castle & Hallwyl museum has profiled itself internationally. * It is the aim of the museum to reach every interested audience member with their digital exhibitions and online collection presentation. Images are offered for free (as in gratis) re-use, information about the works is published as Linked Open Data and the reproductions are used as illustration in articles on Wikipedia through contribution to Wikimedia Commons. Subsequently, a number of current digital heritage subjects were touched upon in three parallel discussion tracks. The track on applications focused on choices and constant considerations. Is the (financial) investment well balanced with the number of downloads and/or users? Can we make our own adjustments to the app’s content, or do we have to get back to the developer in order to make changes? And what about the lifespan of the app? The return on investment of an app for a particular temporary exhibition is different from an app that covers a rather long term collection presentation. Next to the interactive nature of apps, there are also other possibilities to stimulate interaction. The session on user generated content highlighted examples of technologies in which a participant actively enriches information. This appears not to be such smooth process in every case; a crowdsourcing project in the Dutch Rijksmuseum failed for example because of inappropriate tags being applied. The Antwerp Fashion Museum organised a couple of successful edit-a-thons: meetings in which interested audience members edit pages on Wikipedia. The institution can consequently then get to work with this newly added or updated information. Also the Accurator was presented – this is a tool for nichesourcing with which an institution can look for people with a specific (expert) knowledge who can deliver missing information about e.g. a heritage object. Both the cultural and the educational sector are still searching on how to best adapt to the digital society, e.g. by experimenting with new digital teaching materials or new class methods. Next to that, there is still the question how both sectors can get to know each other sufficiently well. From the cultural sector there is a request for cooperation, but also vice versa. Flemish Testbeeld and Cultuurkuur were two initiatives that illustrated the bridge function between these two sectors. The cases that were presented during the day, each formulated an answer to the question: ‘Digital: opportunity or necessity?’. On the one hand it is necessary to embrace the digital realm, but this should then go beyond mere technical solutions. In the Dutch Rijksmuseum, the staff is convinced that digitisation is a true necessity: they share the vision that the museum is obliged to open its collection to the public. It is however imperative that cultural heritage organisations think about this strategically, so that the planned effects of going digital are sustainable in nature. We would like to draw our readers’ attention to three recent Europeana publications dealing with metadata quality and content reuse, two aspects that are also highly relevant for the work of the AthenaPlus project. This document contains a description of the Europeana Content Re-use Framework that has been developed as part of the Europeana Creative project. 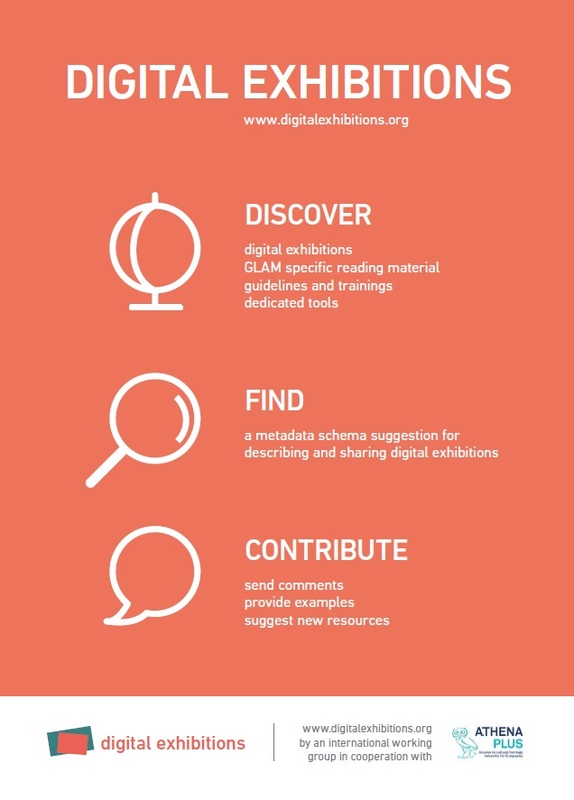 The Content Re-use Framework outlines four scenarios for making cultural heritage objects available via Europeana and is intended to provide guidance for cultural heritage institutions contributing to Europeana. This document deals with Europeana’s data (content+metadata) and partners (aggregators and data providers). It evaluates the accomplishment of earlier goals, provides an overview of the current situation, and defines aims for the coming years. You can download the entire report HERE. This report looks at the factors that affect overall metadata quality, and makes recommendations for its improvement. Metadata quality is controlled by a set of processes which ensures that cultural heritage objects can be identified, discovered and seen in context by audiences, in a manner appropriate to the context in which the data provider created them. 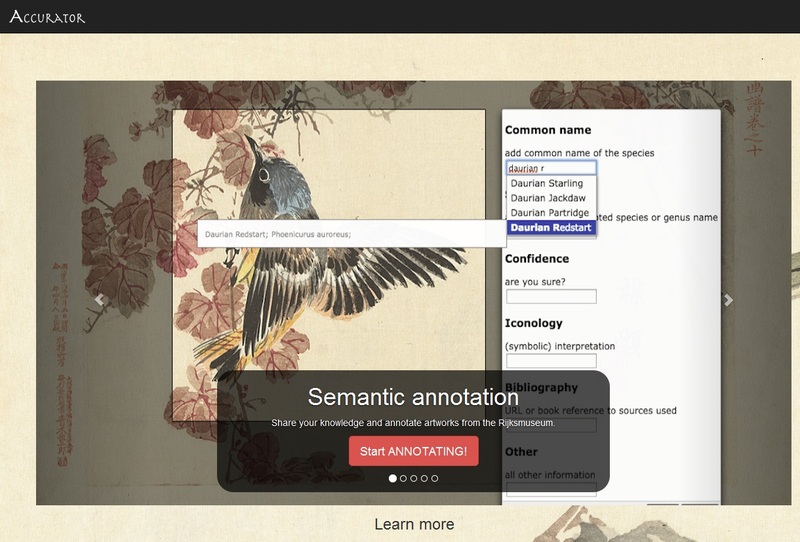 Metadata must include information on the potential re-use of cultural heritage objects. The document analyses how data partners’ motivation, the technical requirements and the content of the metadata affect overall metadata quality. The report on metadata quality is available HERE. The latest Judaica Europeana newsletter features highlights of digital collections, including the Centre of Judeo-Moroccan Culture in Brussels, the Jewish Historical Institute in Warsaw, the JDC Archives, the YIVO Institute and the Leo Baeck Institute in New York. Moreover, readers are provided with reports about developments at Europeana and Judaica Europeana. Open-source tools for the creation of virtual exhibitions (MOVIO), interactive maps (eCultureMap) and thesauri (TMP) – all developed within the frame of the AthenaPlus project – are also presented. These are all exceptional resources for historians, curators, genealogists and anyone interested in European Jewish culture. 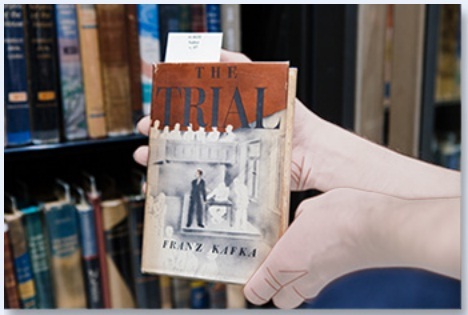 Judaica Europeana is a network of heritage institutions in Europe, Israel and the US which have been working together very successfully to provide integrated access to their digital collections. Inspired by the vision of Europeana―the digital platform for Europe’s libraries, museums and archives, we rely on Europeana’s infrastructure for this ongoing undertaking. For Judaica Europeana AthenaPlus presents a platform for extending access to Jewish collections. The Judaica Europeana partners, who are uploading their catalogues to Europeana through AthenaPlus, include the Ben Uri Museum in London, the Jewish Museum in Prague, the Library of the Jewish Theological Seminary, Medem Library in Paris, the Steinheim Institute, Essen, Bibliotecca Rosenthaliana in Amsterdam and others. The network’s metadata will contribute toward reaching the AthenaPlus target of 3.6 million records in Europeana. On the 23rd of April 2015, the AthenaPlus national conference “Digitisation and Dissemination of Lithuanian Cultural Heritage: Innovative Initiatives, Experience, and Possibilities of Society and Memory Institutions” was held by the Siauliai “Ausros” museum (Siauliai, Lithuania). Almost 100 specialists from Lithuanian museums, libraries, archives and science institutions, the representatives of tourism, creative industries, media sectors as well as other persons interested in the possibilities of digitisation and dissemination of digitised cultural heritage took part in the conference organized at the Photography Museum. At the conference considerable attention was paid to the international project “AthenaPlus” – access to cultural heritage networks for “Europeana”. Project’s coordinator Jovita Vilimaitienė introduced the conference participants to the aims and objectives of the project, presented its results and achievements, and reported on the experiences the Siauliai “Ausros” museum gathered participating in the project. During the presentation, the creative tools – “MOVIO”, “CityQuest”, “School trip” – developed in the frame of the “AthenaPlus” project – were presented in detail. The digital exhibition “The modernist architecture of Siauliai in 1930’s” was showcased as well in order to introduce the functionalities of the MOVIO tool. In general, conference participants were enthusiastic about the innovative tools for the dissemination of digitised cultural heritage content as well as the possibilities of communication provided by these services. At the conference further national and international digitisation and dissemination projects were discussed. 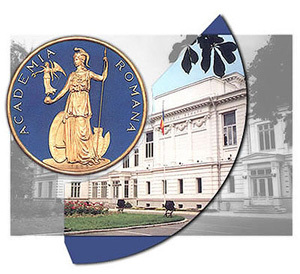 Moreover, innovative initiatives contrived by science and memory institutions as well as private initiatives for the reuse of digitised cultural heritage content were introduced. To top off the event brand new technological innovations from the sector of cultural heritage communication were presented and demonstrated. Further information about the event can by found on the website of the Siauliai “Ausros” museum (in Lithuanian only). The national conference was also mentioned in a TV broadcast (see from 11:48).